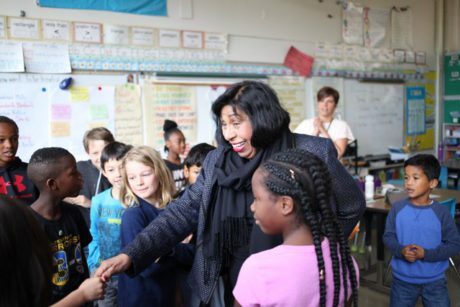 Noted civil rights activist Sylvia Mendez, who was at the center of the landmark case that led to California being the first state to desegregate its schools, will speak at Longfellow Middle School at 6 p.m. tonight, April 13. It was 70 years ago this month that the U.S. Court of Appeals in San Francisco ruled segregation illegal in California public schools. The student at the center of the case when it began was 3rd grader Sylvia Mendez, who had been required to attend a separate school for students of Mexican descent in Orange County. Her father, Gonzalo Mendez, was the lead plaintiff in the suit that is now famous, Mendez v. Westminster. Two months after the decision, then California Gov. Earl Warren signed a bill officially ending segregation in the state. At the urging of her mother, Mendez devoted herself to telling the story of her family and the legacy of the famous case. She received the Presidential Medal of Freedom from President Obama in 2011, along with other such notables as Maya Angelou, Yo Yo Ma, former President George H.W. Bush, German Chancellor Angela Merkel, Jasper Johns and Warren Buffett. Her appearance at Longfellow is sponsored by the Cesar Chavez and Dolores Huerta Commemorative Committee. See a Berkeleyside article about her visit. See the film, Class Action: Mendez v. Westminster, made by Lisa Rossi’s 2nd grade students last year. Last month it received a 2017 Children’s Choice Award at the Bay Area International Children’s Film Festival.